In its Welcome Offer, Reliance is giving free 4G data to all its users. 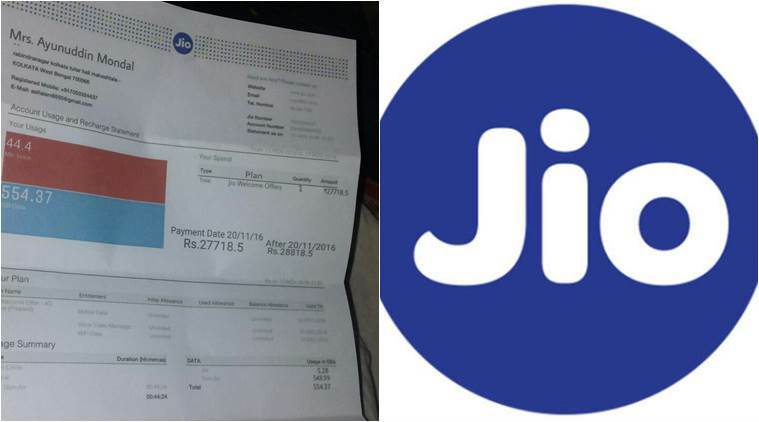 What’s doing the rounds on Facebook, Twitter and WhatsApp is a Reliance Jio bill of Rs 27,718 for using 554 GB issued to a Kolkata-based customer Ayunuddin Mondal. The bill also stated that in case of late payment, a charge of Rs 1,100 will be levied on the user. But guess what? It’s fake. The bill is a hoax which is photoshopped to perfection because the Reliance Jio service is absolutely free till December 31, 2016. In its Welcome Offer, Reliance is giving free 4G data to all its users which have reportedly crossed 2 crores in the first two of its roll out. According to a few social media users, the bill, origin of which is still unknown, was spread to create panic among users. The number mentioned in the bill is switched off. “The bill in circulation is fake. Currently, we are offering services under Jio welcome offer, and we reassure our existing customers as well as potential customers who subscribe to Jio connection till December 3 that benefits of free unlimited voice and data will be available to all till 31st December 2016,” Jio spokesperson told Economic Times. Check out the fake bill that’s gone viral here. Interestingly, according to the ET report, Reliance is likely to extend the offer till March 2017 and is also going to make an announcement on December 28.